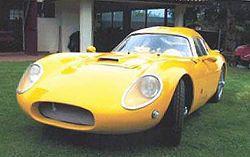 This unique ‘one off’ Alfa Romeo powered sports coupe was built in 1968 by Autotecnica del Lario of Lecco. Developed largely along the lines of the Alfa Romeo 2000 Prototype built by the company in 1954, the chassis consists of different diameter special steel tubing with boxed-in sections to which all of the mechanical ancillaries are attached. 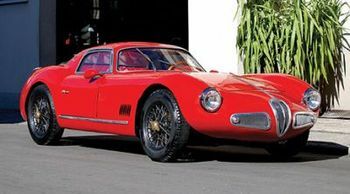 The stunning bodywork is in 12/10 gauge aluminum and is suspended over a steel birdcage like the patented Touring Superleggera method on the Maserati 3500GT or Aston Martin DB Series. Suspension is independent on all four wheels with coil spring shock absorbers, together with front disc and rear drum brakes and Borrani wire wheels. The engine is Alfa Romeo’s classic two liter twin camshaft unit, and with the car weighing in at only 810kg this makes it a very fast sports. Reminiscent of the 3000 MM and Disco Volante coupes, the stunningly executed lines of this car are every bit as good as anything created by Alfa Romeo at the time. The Fiat 1100 was first introduced in 1939 as an updated version of the 508; indeed, its real model name was 508C and it also had an appearance similar to that of both the 1936 Fiat 500 Topolino and the middle of the range 1500 model, including the typical late ’30s heart-shaped front grille. In 1953 the 1100 was completely redesigned as a compact four door saloon with a modern monocoque chassis and bodywork incorporating integrated front lights. Soon the car became available as a sports version, the 1100TV, with a third front light, and also as an estate version with a fifth door on the square tail. In the 1950s it was the basis for many of the upcoming Etceterini in Italy. This fantastic looking barchetta is based on a 1957 Fiat Trasformabile and has been re-bodied by ATL (Autotecnica del Lario) in 1968, using Touring’s superleggera principle, where a tubular chassis is clad in aluminium panels. The dimensions, including the wheelbase and ground height, are the same as those of a Fiat Trasformabile, while mechanical components such as the engine, gearbox, steering and brakes are all tried and tested Fiat items. Based on a famous barchetta which was built in very small numbers by Mandarini, a small but respected coachbuilder in Milan, in the 1950s.